Navigating conversations and articles about the paving & construction industry can be difficult. There are a lot of industry-insider acronyms and phrases that mean very little to the average property manager, business owner, or non-profit committee member. Or, if a term is partially familiar, a deeper understanding can surely lend much more value to a conversation. New hires to the industry would also do well to sit with a glossary of terms such as this one and digest the information. We compiled this page to help you get a thorough grasp on what your paving contracting company means when they’re talking about the specifics of your paving project. AASHTO – The American Association of State Highway and Transportation Officials, which sets standards and guidelines and highway design and construction in the United States. Accelerators – Compounds added to concrete or asphalt used to decrease the curing time of the material, making the pavement usable faster. Aggregate – A term used to describe the collection of small or large stones that comprise the structure of an asphalt layer or of concrete. Alligator Cracking – A common kind of damage on an asphalt surface that can be attributed to sub-base failure, an insufficient drainage system or repeated exposure to intense weight loads. Asphalt – A mixture of bitumen and an aggregate (a collection of coarse stones), that makes up ~95% of roads and highways in the United States. Asphalt is a flexible pavement, making it more capable of properly distributing the stress created by repetitive and consistent traffic. Asphalt Cement Concrete (ACC) – Another term used to refer to asphalt or blacktop pavements. Asphalt concrete is technically the term used for an asphalt mix after it has been bound to the aggregate. Asphalt Concrete (AC) – Another term used to refer to asphalt or blacktop pavements. Asphalt concrete is technically the term used for an asphalt mix after it has been bound to the aggregate. Asphalt Leveling Course – A course of hot-mix asphalt of a uniform or variable thickness used to eliminate irregularities in the surface of a pavement before laying on a new course layer. Asphalt Sagging – Asphalt sagging can usually be attributed to a poor sub-grade and refers to depressions in the asphalt’s surface ranging from 1/8″ to 4″. Unattended sagging can be dangerous for drivers. Anything over 4″ over the course of 10 ft. is considered a high-severity sagging issue. ASTM – The American Society of Testing and Materials, responsible for developing uniform standards for assuring product quality in various industries, including asphalt and concrete. Base – Referring either the asphalt concrete sub-base, the sub-grade, or both, as part of a pavement design. Base Failure – When an asphalt pavement no longer holds its original shape or fails to serve its intended purpose. Bid Package – A collection of documentation for the company placing a bid on a project, usually found exclusively in public projects. Included is the “invitation to bid” form, a series of state regulatory guidelines relevant to the project, and internal department policy standards that the paving/construction company must also adhere to. Bitumen – A viscous, semi-solid form of petroleum used in combination with an aggregate to create asphalt cement. It can also be used for waterproofing products. Bollard – A vertical post seen outside of a business or establishment for traffic control and pedestrian protection purposes. Bollards were first used to help moor ships alongside their loading docks. Decorative bollards are becoming an increasingly popular way to control traffic and protect a business from oncoming traffic, while simultaneously increasing curb appeal. Bollards for security are becoming popular to defend from ram-raid attacks. Car Stop – Also known as a parking block. A car stop is a cement block placed in front of a parking space to prevent a car from rolling through the intended parking area. Catch Basin – The system which begins with a grate that leads water underground and away from the area. The “steel grids” you see alongside roads are a kind of catch basin. These are essential to any urban development, as they prevent flooding and problematic pools of standing water from occurring. Cold Patch – An asphalt repair material that can be applied to a pothole directly from the container at room temperature, allowing asphalt road or parking lot repair to take place quickly at nearly any time of the year. Compaction – The density of a laid sheet of asphalt is the single most important factor to determine the longevity of the pavement. A hot-mix asphalt must compact with between 3-5% air voids to maximize the asphalt’s quality. Concrete – A mixture of cement paste and an aggregate (a collection of coarse stones, usually sand) that hardens into a pavement. Most concretes are limestone based concretes, such as PCC (Portland Cement Concrete). Concrete cement is a rigid pavement, making it much more durable than asphalt, and is installed in “joints” to guide the inevitable cracking into non-problematic areas. Concrete Joints – Because concrete can withstand no amount of bending, and concrete naturally shrinks over time, concrete is installed in joints, or sections, and joined by a much thinner bit of concrete. This joining section is created to crack first when the concrete finally gives, allowing the damage to begin somewhere that is not clearly visible to the naked eye, thus extending the aesthetic lifespan of the concrete. To prevent further damage by moisture, joint sealant may be installed on top of a concrete joint. Crack Sealing – The process of filling a crack in asphalt with a rubber-like, tar-based material to close off the crack from the elements, thus preventing further damage to the asphalt’s surface or foundation. Cracking – The separation of sections of asphalt made possible by asphalt oxidation, temperature changes and/or sub-grade movement. Cratering – A term used to describe potholes which have grown so large they resemble craters. Deflection – The shifting in pavement leveling due to high pressure from the presence of intense weight loads. Design-Build – A method of project delivery where the same company or entity designs and executes the delivery of design plans. Therefore, the bidding process is bypassed. Emulsion – The process of mixing two or more liquids that are naturally unmixable. Because equilibrium is forced, the two liquids will destabilize over time and again separate. Depending on the quality of the emulsification and the liquids involved, the destabilization process can take anywhere from hours to years. Estimator – An asphalt paving expert who will visit your property and make the necessary measurements to give you a price for the paving, maintenance, or construction work you need accomplished. Excavation – For construction, earth is removed to meet the foundation level necessary for the job after the underlying soil and clay has been tested and discovered to be structurally sound. Excavation also often refers to land clearing tasks, such as removing stumps, and moving dirt around to meet the needs of the blueprint. Expansion – Usually referring to when moisture expands during the freezing process, causing damage to asphalt where water has percolated through the surface or into the pavement. Flexible Pavement – A pavement that features some amount of elasticity to weight. Asphalt pavements are flexible pavements. Frost Heave – When an asphalt pavement bows upward or shifts upward due to moisture freezing and expanding within the sub-grade. A frost heave may also be used in reference to soil taking on freezing moisture and expanding that is not included in the sub grade. Full-Depth Repair – When the sub-base of a pavement has failed, or a pothole damage has reach the sub-base of a parking lot, the only way to truly address the issue is by a full-depth repair. A full depth repair requires a complete excavation of the problem area, or sometimes can be resolved with a deep saw cutting. The area is removed, and then the pavement structure is rebuilt in its place, from the bottom up. Grinding & Milling – The removal of the surface layer of an asphalt pavement using a milling machine, and then the replacement of a new asphalt surface layer. Hot-Mix Asphalt – The current industry standard of asphalt mix that requires compaction at extremely high temperatures, usually above 100 degrees Celsius. Hot-mix asphalt consists of 95% aggregate and 5% asphalt cement, a bituminous product. Infrared Repair – The process of using infrared heat to re-heat an asphalt surface, thus restoring the semi-liquidity of the bitumen, and raking the asphalt to eliminate the crack or other problem area. Joint Cracking – The cracks running through concrete joints. These cracks are intended to occur first on the concrete pavement as it shrinks and act as a load-distributing mechanism for a concrete pavement. ODOT – The Ohio Department Of Transportation. Overlay – The process to laying a new asphalt layer over an existing asphalt surface that is excessively damaged or deteriorated. An overlay will increase the overall elevation of the parking lot. Overspray – The act of applying sealcoating beyond the intended bounds of the sealcoating job, such as onto grass or landscaping surrounding the asphalt pavement. Oxidation – A molecular process that naturally occurs in asphalt. New bonding sites are created, and as the molecule seeks to close these bonds in an effort of finding thermodynamic equilibrium. As more and more of these bonds are satisfied, the pavement becomes more rigid and brittle, increasing the likelihood of cracking and damage. Partial-Depth Repair – A pothole that affects more than the surface layer of the pavement. Partial depth repairs begin by making the pavement damage even in depth by milling or saw-cutting, then replacing the area with new asphalt layers. Pavement Failure – Any condition where the asphalt pavement no longer adheres to its original state and takes on excessive material stress. This will manifest in the form of cracking, potholes, or sagging. Pavement Interactive – A paving reference website where customers, clients, technicians and students can find paving information, best practices, and resources at their fingertips. Permeable Pavement – A new, green form of paving that allows surface moisture to fall completely through the pavement via pores created by its aggregates. Water is then filtered through below to a place that will not contribute to the possibility of pavement failure. Photocatalytic Concrete – Concrete mixed with photocatalysts, which accelerate the rate at which contaminants and pollutants from the environment can be broken down, or decomposed to have a minimal effect on the environment. Porous Asphalt – A “pervious asphalt” that allows water to sink completely through the asphalt structure and into an underground storm water management system. This breakthrough technology uses various layers of large and small aggregate to create a stable surface for the flow of traffic while requiring less maintenance and water-related damages. This kind of asphalt is very popular in Japan and Europe. Portland Cement Concrete (PCC) – A limestone-based cement product that makes up most concrete pavements in the United States. It is comprised of cement, an aggregate (such as stand, grushed gravel, crushed limestone, or crushed granite) and water. Pothole – A hole created by the growth of a crack or multiple cracks in an asphalt or concrete pavement. Potholes can be repairs via “patching,” or filling the opening with enough asphalt or concrete to close the gap. Puddling – The development of standing water on an asphalt pavement. 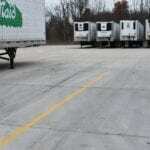 When you see puddling, this should be addressed and leveled out, as this area will oxidize and degrade more quickly than any other area of the pavement. 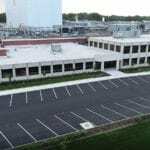 Pulvamix – A process of creating reclaimed asphalt pavement. Quiet Pavement – A recent development in pavement engineering that uses open-graded friction course mix to reduce the sound traffic makes when moving across the surface. A quiet pavement can reduce the general level of noise made by traffic by 5dB or more. RAP (Reclaimed Asphalt Pavement) – Reclaimed asphalt pavement refers to the lifted and grinded asphalt millings of old asphalt pavements. These millings can be used as the sub-base for almost any pavement or gravel section. The process of using reclaimed asphalt pavement does not restore the asphalt cement potential of the material. RFP – A request for proposal, where a company announces that a certain project has the necessary funding and is actively taking bids for the project. A request for proposal differs from an RFQ because the institution receiving proposals can decline a proposal based on factors other than price. RFQ – A request for quotation, where a company announces that they are taking bids for a project. An RFQ generally takes place for projects that are commoditized and standardized, therefore each company’s quotation lies within a very precise range. Reflection Cracking – Cracks that appear on an asphalt overlay that match or align with cracks that existed on the original pavement surface. Joint reflection cracking appears when an asphalt surface laid on top of a PCC surface begins to crack in the same pattern that the concrete joints cracked or separated underneath. Resurfacing – The application of a new surface layer on an asphalt pavement over the existing, damaged asphalt surface. A resurfacing does not account for external variables affected by the elevation of the pavement surface, and is often installed at a height of 1.5″ or 2″. Rigid Pavement – A pavement such as Portland Cement Concrete that does not have any flexible qualities inherent to the material. Rutting – A surface depression on an asphalt pavement along the wheel paths of oncoming traffic. This pavement failure is caused by using too thin of a pavement, weak asphalt mix, or poor asphalt compaction. Sealcoat – A protective coating for application on asphalt pavements that prevents the rate of oxidation, as well as other potentially damaging phenomenon. The damaging effects of water, oil, gasoline, and sunlight are mitigated by regular sealcoating. A diligent sealcoating program can extend the life of an asphalt pavement by up to 25%. Shoving – An issue that occurs with asphalt and is defined as the formation of “ripples” along the surface of an asphalt pavement. It is most commonly caused by laying too much asphalt at once, using too soft of an asphalt mix, or the use of a weak granular base. Slope – The change in elevation on a pavement used to guide water to its intended drainage area. Storm Drain – The system which begins with a grate that leads water underground and away from the area. The “steel grids” you see alongside roads are a kind of catch basin. These are essential to any urban development, as they prevent flooding and problematic pools of standing water from occurring. Structural Overlay – An industry-insider term for resurfacing. Sub-base – The first layer of coarse aggregate laid on the sub-grade. This layer is ultimately what will bear the majority of the weight distributed on the pavement surface. This aggregate is usually an “unbound granular material” such as stone, crushed concrete, slag, or slate. Sub-grade – The base surface underneath any construction of a pavement. The sub-grade must be evaluated to ensure it will be able to support the pavement and the expected amount of traffic without significantly shifting or causing damage to the asphalt or concrete. Tack Coat – Usually an emulsion asphalt based oil applied to existing asphalt before new asphalt is laid as part of a repair or an overlay. A tack coat has adherent properties that help new asphalt bind to the old asphalt layer. Transverse Cracking – A crack that runs at a 90 degree angle from the direction the asphalt or concrete was originally laid. Vibratory Roller – Compaction rollers that can also vibrate at various frequencies to deliver asphalt compaction with fewer passes. Warm-Mix Asphalt – A kind of asphalt that can be handled 30 to 120 degrees Fahrenheit lower than traditional hot-mix asphalt. Because it cools more slowly than hot-mix asphalt, it can be successfully placed at lower temperatures, thus effectively extending the paving season. Wedging – Laying asphalt in the shape of a “wedge” to leave the overlay with an even pavement surface, making up for any changes in elevation on an asphalt surface.